Invasive fungal infections kill more than 1 million people worldwide every year. Almost all of these deaths are due to fungi in one of these four groups. Credit: Centers for Disease Control and Prevention. Invasive fungal infections—the kind that infect the bloodstream, lung and brain—are inordinately deadly. A big part of the problem is the lack of drugs that are both effective against the fungi and nontoxic to humans. The situation might change in the future though, thanks to the work of a multidisciplinary research team led by chemist Martin Burke at the University of Illinois. For years, the team has focused on an antifungal agent called amphotericin B (AmB for short). Although impressively lethal to fungi, AmB is also notoriously toxic to human cells. Most recently, the research team chemically modified the drug to create compounds that kill fungi, but don’t disrupt human cells. The scientists explain it all in the latest issue of Nature Chemical Biology. Invasive fungal infections are so intractable because most antifungal drugs aren’t completely effective. Plus, fungi have a tendency to develop resistance to them. AmB is a notable exception. Isolated 50 years ago from Venezuelan dirt, AmB has evaded resistance and remains highly effective. Unfortunately, it causes side effects so debilitating that some doctors call it “ampho-terrible.” At high doses, it is fatal. DNA comes in three forms: A, B and Z. 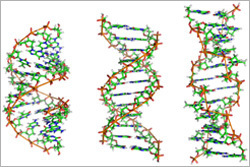 Credit: A-DNA, B-DNA and Z-DNA by Zephyris (Richard Wheeler) under CC BY-SA 3.0. DNA researcher Rosalind Franklin first described an unusual form of DNA called the A-form in the early 1950s (Franklin, who died in 1958, would have turned 95 next month). New research on a heat- and acid-loving virus has revealed surprising information about this DNA form, which is one of three known forms of DNA: A, B and Z. A new study suggests that an antibiotic regimen half as long as the standard course could be just as effective in treating intra-abdominal infections and preventing sepsis. Credit: Stock image. When treating infections, the most critical actions are to quash the infection at its site of origin and prevent it from spreading. If allowed to spread to the bloodstream, an infection could result in body-wide inflammation known as sepsis that can cause organ failure and death. 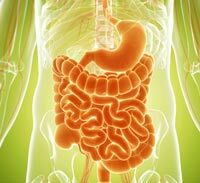 Intra-abdominal infections, most often caused by gut bacteria, can lead to painful inflammation and present a high risk for sepsis. These infections, which include appendicitis, are some of the most common illnesses around the world. A standard treatment regimen includes surgically removing the original infection and then prescribing antibiotics to keep the infection from coming back and to prevent sepsis. Currently, doctors administer antibiotics until 2 days after the symptoms disappear, for a total of up to 2 weeks. We asked the heads of our scientific divisions to tell us about some of the big questions in fundamental biomedical science that researchers are investigating with NIGMS support. This article is the first in an occasional series that will explore these questions and explain how pursuing the answers could advance understanding of important biological processes. 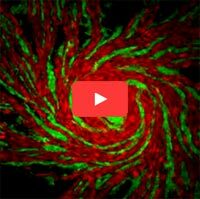 This video shows different strains of amoeba cells in red and green. As cells move toward one another, they use two sets of proteins to recognize others from the same strain. When close relatives meet, their proteins match and the cells join together to form a multicellular structure. When cells from different strains meet, their proteins don’t match, so they can’t aggregate. Credit: Shigenori Hirose, Baylor College of Medicine. Cells are faced with many decisions: When’s the best time to produce a new protein? To grow and split into two? To treat another cell as an invader? Scientists are working to understand how cells make these and many other decisions, and how these decisions contribute to health and disease. 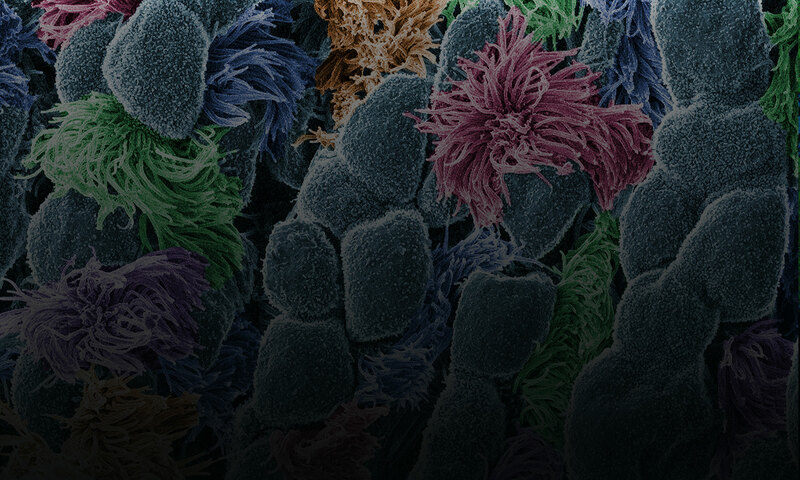 An active area of research on cell decisions focuses on allorecognition, the ability of an organism to distinguish its own cells from those of another. Immune cells use a system called the major histocompatibility complex (MHC) to identify which cells belong to the body and which are foreign. The particular set of MHC proteins on the outer surface of a cell helps immune cells decide whether it does not belong and should be attacked.